What do you do when you have a problem in life? All these methods can give you a solution or maybe multiple solutions, but how can you ensure that the solutions are permanent, and they will solve the issue at the root? Now, that is something you really can’t be confident. There is another fact that you need to think here. Be it business friends or relatives, their solutions are probably biased and prejudiced. Or, they may give you solutions that worked for them, but may have no relevance in your Business. So, what is the solution? It is best to go to a Business coach who can listen to your challenges with an unbiased mind and help you identify the root cause of the issues. A Business coach also offers coaching and mentoring services, which can help you systematically think and resolve your challenges and helps you work in growing your business. A business coach helps you face your business issues and helps you solve the business challenges by identifying the root cause of the problems. The point to note here is that business coach doesn’t solve your problems, but guides and assists you in the solving your own business issues by providing you with a systematic business success framework. Are you a little worried about taking your business challenges to an unknown person? That is probably the best part of the whole thing. Whether your business or professional problems are to do with business growth, losses, employee management or daily operational challenges, you can confidently talk about it to a business coach. In case, you find it difficult go for a one-on-one business coaching session in Bangalore, you can opt to consult an online business coach. You can talk to the business coach online from the comfort of your home. Just fill in our online form right away to take advantage of our one-hour free business health check up session. Meeting Sumit changed my business, personal life and inner-self for the better in so many ways! He is a coach that truly cares about his clients. I’ve done one-on-one sessions with him. Each session has been inspiring and extremely well worth the time and investment. I enjoyed the most when I got a form understanding of who I am and what my core identity is. Life since then has been more aligned. Sumit really made me think about what it was I wanted to do, structuring my goals in a way that I’d never thought of before, helping me focus on the things that really mattered to me and how I could achieve them, ultimately finding the right path for me.He taught me how to choose my own directions and grow as a person for unlimited happiness. I discovered the need to set goals, achieve them and celebrate. I have gained a lot more than I expected from life coaching. This is just the start of the new me. Sumit will ask you deep questions which you didn’t know you need to ask yourself. He will empower you to design your life how you would like it to be. He does this with a great sense of humour and incisive questioning. He works with you on the core of yourself and does wonders with the understanding of your mind. He emphasises a lot on creating awareness around and then starts progressing from there. Sumit is an exceptional thinker, well wisher & mentor. I had an opportunity to get his guidance , learnt a lot from him. He taught me how to execute small tasks properly before eyeing at big tasks. I would recommend him anytime, be it a personal goal or career goal, he make a very good coach. Business success – This is success story of Mr.NEERAJ SINGHAL, Owner – TESMENTO IT PROFESSIONAL & SOFTWARE DEVELOPMENT; how working with I Design My Life helped him to increase his revenue and grow his customer base. 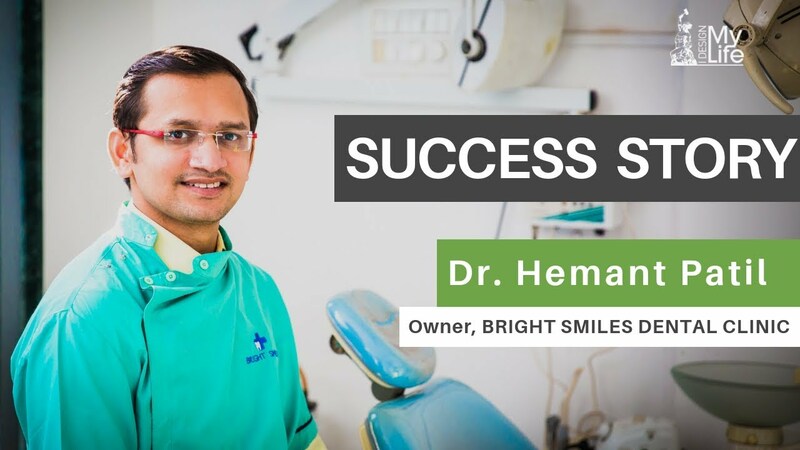 This is success story of Dr Hemant, dentist; how working with I Design My Life helped him to increase his patient's delight and grow his dental practice systematically. Customer delight is important to have more of repeat and referral in any business. Business success – This is success story of a business owner – Sandeep – Franchise Owner SRL Diagnostics; how working with I Design My Life helped him to grow his business successfully. What is Business coaching about ? Business coaching is about accelerating and winning in your Business. Business coaching is about bringing in deeper changes within your organisation leading to growing and successful business. Business coaching is about getting an expert to work with you so you get to tackle business challenges and focus on growth. Business coaching accelerates the process of achieving your business goals. Goals could be resolving certain challenges, achieving a financial goal for your organisation, manufacturing or selling products by a certain time, acquiring target leads, providing consistent quality services, and so on. Who is this Business Coaching for? If you are a person who is committed to your goals and desire growth in your Business with a holistic approach, who is ready to view your business from all different directions and perspectives- then you are the one who business coach is made for! What all areas can business coach help me? We help you with unconventional strategies that will ingrain practical skills that you can build right away to gain complete mastery in your business life. Our coaching helps you with actionable principles, techniques and practices that are used by the most influential thought leaders and business owners across the globe. We help you in accessing your current business health, your growth goals, understanding your prospect, problem, product, help you with your growth strategies, growth processes, and growth team. We eventually help you establish your business on Autopilot mode. Sumit Agarwal - Business and life coach, was instrumental in bringing his previous company, Edureka from a 0 to 250 crores value; without any funding, within a time span of 4 Years. The strategies that he suggests have been devised taking care in mind that almost all growing businesses have limited funds. Sumit has been working with numerous CEO's, entrepreneurs, business owners who want to grow their organisation. He is actively working with small business owners who want a systematic approach and growth in their business. Transforming and designing our own business and lives is our sole mantra. The coaching process comprises knowing you and your business, understanding your business vision, your current challenges, looking deeper into your business issues and then creating a growth plan, execution of the growth plan and entire support during the growth execution phase. How many session would I need? What all is required from my side? All we need from you is a commitment to your business growth and the rest will be taken care off. When and how is this coaching conducted? The coaching sessions are conducted on zoom/skype and on phone. We are also available for face to face sessions in Bangalore if required. Online session gives our client the flexibility of timings and most of our clients prefer this. Is the money worth the investment? Sometimes we are asked is the money worth the investment . Our answer to this is every penny of investment is worth if it grows you and your business. Your investment pays off with returns that you cannot expect and we are confident because we have done this with many of our clients with clear financial and business returns. How do I contant you?